RBTH presents a selection of views from leading Russian media on international events, featuring a report from the International Security Conference in Moscow, as well as news of political killings in Ukraine and analysis of the potential implications of Russia’s supply of S-300 missiles to Iran in the context of avoiding conflict in the Middle East. The Gazeta.ru online newspaper reports that Iran has proposed forming a defensive alliance with Russia. The initiative was announced during the International Security Conference in Moscow, which was attended by representatives from 70 countries. Gazeta.ru says that not a single representative from the US or NATO came to Moscow, which obviously had an impact on the event's rhetoric: The participants spoke about the necessity of a joint battle against international terrorism, but also constantly "attacked" Washington. 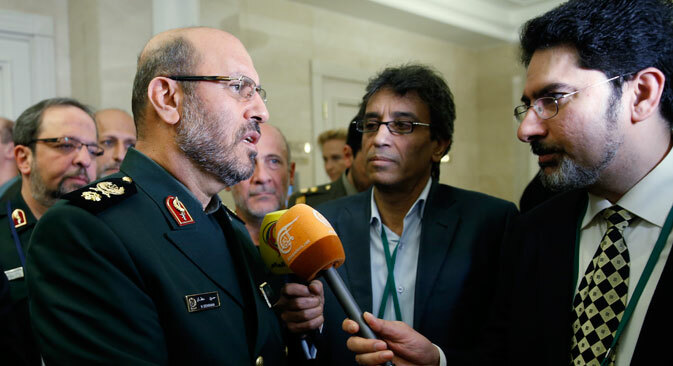 Iranian Defense Minister Hossein Dehghan dedicated his speech to the battle against the Islamic State terrorist group. Touching upon the sensitive issue for Russia of NATO expansion, he suggested creating a "defensive alliance," which, besides Russia and Iran, would also include India and China. An unnamed source in the Russian Defense Ministry told Gazeta.ru that "Russia now finds itself in strategic solitude and is trying to reach anyone possible in order to show the world that it is not isolated." The daily business newspaper Kommersant writes that two resonant political murders have taken place in Kiev. Two opponents of the current government have been killed in the last two days in the Ukrainian capital: Oleg Kalashnikov, a former parliamentary deputy from the Party of Regions and one of the creators of the Anti-Maidan movement [opposed to Kiev’s current government and policies – RBTH], and journalist Oles Buzina, who often appeared on Russian TV channels with an extremely critical position in relation to the government in Kiev. According to Kommersant, the murder of these prominent critics is being perceived as a warning in Ukraine, with views differing only on the question of who ordered them. Government representatives and mass media loyal to them are talking either of provocation from the Russian special services or of "criminal clashes" among associates of ex-Ukrainian President Victor Yanukovich who are removing potential witnesses and incriminating traces on the eve of criminal trials planned against them. According to Ukrainian President Petro Poroshenko, the aim of the criminals is to "destabilize the domestic situation in Ukraine and discredit the political choice of the Ukrainian people." Opponents of the government, on the other hand, are speaking of the beginning of political terror directed against the opposition, writes Kommersant. The Nezavisimaya Gazeta centrist newspaper reports that in the course of his current visit to Washington, Iraqi Prime Minister Haider al-Abadi has put his hosts in an uncomfortable position: Instead of thanking U.S. President Barack Obama for the supplies of American arms and advisers, he criticized the Saudi bombardment of Yemen. In turn, Saudi Arabian Ambassador in Washington Adel al-Jubeir criticized the actions of the Iraqi government. Meanwhile, the UN’s special envoy to Yemen Jamal Benomar has announced that he is resigning. "Does this mean that the fire will spread further?" asks Nezavisimaya Gazeta, wondering how Moscow's recent decision to supply Iran with the S-300 anti-aircraft missile systems will affect the situation. The publication cites David Goldman, an analyst from the Royal Institute of International Relations in London, who says that by doing this Russian President Vladimir Putin showed Obama that he has the means to make the U.S. take Russia's interests into consideration. In the view of Indian diplomat and observer M. K. Bhadrakumar, this step will help to cool hot heads and lead to a détente. Read more: Is decision to supply Tehran with S-300 missiles a signal from Moscow?